Patton Oswalt’s newest comedy album, Patton Oswalt: Annihilation will be released by Comedy Dynamics on December 21, 2018 and will be available on iTunes, Google Play, Amazon and Spotify. 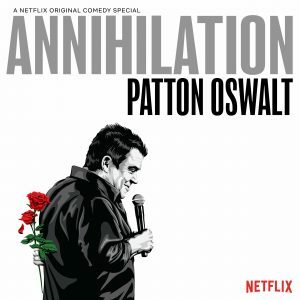 Patton Oswalt: Annihilationis a deeply personal and powerful stand-up special that dives into recent developments in Patton’s life, following the passing of his wife, and how he worked through the pain and grief by finding humor. Oswalt also explores topics including the angst of social media, the current political climate and being tricked by robocalls. Filmed at Chicago’s Athenaeum Theatre, the one-hour stand-up special originally premiered globally on October 17 on Netflix. This new special came off the heels of Patton’s Emmy award-winning comedy special, Talking for Clapping. Patton Oswalt is a stand-up comedian, actor, voice actor and writer known for his roles on The King of Queens, voicing Remy in the film Ratatouille, Young Adult, Agents of S.H.I.E.L.D., the 2017 revival of Mystery Science Theatre 3000and comedy albums such as Talking for Clapping, My Weakness Is Strong and Tragedy Plus Comedy Equals Time. Annihilation is Patton’s 8th comedy album and the first released by Comedy Dynamics. “Patton is truly an icon by any definition of the word and it’s always an honor to work with the greats.” said Brian Volk-Weiss, CEO of Comedy Dynamics.